In today's Daily Telegraph, a certain 'Vanessa Neumann', puts the boot in big time on Hugo Chavez, Venezuela's Red 'dictator'- you know the 'dictator' who keeps winning free elections and has a penchant for holding referendums (unlike the wonderfully democratic British government). I'd never heard of Vanessa Neumann before, so I did some research. Vanessa Neumann Donnelly (born on 1974 in Caracas, Venezuela) Vanessa Neumann Donnelly is a Venezuelan well-known socialite, entrepeneur and occasional model. The heiress of Hans Neumann (who died in 2001), a Venezuelan millionaire, entrepreneur and former owner of Corporacion Industrial Montana. Vanessa grew up in the wealthy eastern side of Caracas practicing ballet and enjoying the Venezuelan high-society life. So there we have it. A wealthy Venezuelan heiress- who naturally is going to be hostile to the redistributive socialist policies of the Chavez government- writes an opinion piece for a British national newspaper attacking her country's government-and the newspaper in question doesn't think that information regarding her background is worth revealing to its readers. You can read more on Ms Neumann, and her marriage into a Tory dynasty here. … he is murderous to the Venezuelans who don't support him...An inexpensive bullet would solve this problem. Chavez deserves to die for supporting FARC...If he wins, I will blow his head off. Stupid little runts support scum like Chavez, Brown, and Obama becuase they are parasites...You want to steal from me? I will beat you down before I allow you to steal my property. Aren't 'Charles', 'Andre' and 'Lisa' such charming individuals? 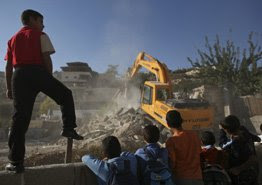 In an attack which shocked Tel Aviv by the harshness of its tone, Switzerland has accused Israel of wantonly destroying Palestinian homes in east Jerusalem and near Ramallah in violation of the Geneva Convention's rules on military occupation. It's arguably the strongest condemnation of Israeli policy towards the Palestinians to come from any western European country since Charles de Gaulle famously attacked the "oppression, repression and expulsions" of Palestinians by Israel over 40 years ago. And it's come from a country that's not exactly famous for making strong condemnations. The statement last Thursday from the Swiss Foreign Ministry said that Switzerland - the guardian of the Geneva Convention - regards the "recent incidents", under which scores of Palestinian homes have been destroyed by Israeli bulldozers, as "violations of international humanitarian law" and claimed there was "no military need to justify the destruction of these houses". In addition, the Swiss called east Jerusalem an "integral part of the occupied Palestinian territory" - a statement sure to inflame hard-line Zionists who regard the entire city as belonging to Israel. The Swiss attack on Israeli actions might surprise some, but it is only the latest incident in a rising 'cold war' between the Alpine republic and the Jewish state. Earlier this year, Israel summoned Swiss Ambassador Walter Haffner to its Foreign Ministry offices in Jerusalem to protest against Switzerland's signing of a multi-billion dollar energy deal with Iran. So incensed were Zionists when Swiss Foreign Minister Micheline Calmy-Rey wore a headscarf and was pictured smiling and joking with Iranian President Mahmoud Ahmadinejad in Tehran, that the Anti-Defamation League placed a series of advertisements in various national newspapers - including Swiss ones - which claimed that Switzerland's energy deal with Iran made Switzerland the "world's newest sponsor of terrorism". Calmy-Rey reacted angrily to Israel's criticism, saying that Switzerland was "an independent country that has its own strategic interests to defend". It's possible to trace the deterioration of Swiss-Israeli relations to 1998, when Israel was compelled to write a formal letter of apology to Switzerland after five Mossad agents were caught trying to install surveillance equipment in an apartment in Berne in order to bug a Swiss citizen whom Mossad believed was linked to Hezbollah. In the intervening period Switzerland has become an increasingly vocal champion of the Palestinian cause. As the Middle East conflict escalated, the country even halted all arms sales and military co-operation with Israel for three years in 2002. Earlier this year, Switzerland was among the 30 countries who voted in support of the UN Human Rights Council resolution that condemned Israel for "grave violations of the human and humanitarian rights of the Palestinian civilians living in Gaza". It wasn't always like this. The Swiss-Israeli war of words is ironic given the fact that the world's very first Zionist congress was held in Basle in 1897 - and that 15 of the first 22 Zionist Congresses were held in Switzerland. The Swiss condemnation of Israel today may be dismissed by some as having little global importance, but there are good reasons why Israel ought to be concerned. As guarantor of the Geneva Convention, Switzerland has the power to call meetings of the treaty's signatories if it finds problems with its implementation - something which would be very embarrassing for Israel. And while it's one thing for Israel to be condemned by countries with a poor human rights record such as Cuba and Saudi Arabia - it's quite another for it to be criticised by a country whose record is beyond reproach. The fact that Switzerland - the home of the Red Cross - has not been involved in a military conflict for 200 years, gives the country a moral authority that many others lack. Switzerland's independent line on Middle East issues also shows the advantage of maintaining national sovereignty in an age where most countries in Europe have surrendered important decision making powers to the EU. While other countries in Europe have been cajoled, under US and British influence, to moderate their criticisms of Israel's treatment of the Palestinians and to agree to swingeing sanctions on Iran - non-EU Switzerland is free to make its own decisions and to say what it thinks about Israeli actions. It helps, too, that Switzerland is rich enough to follow its own path, without fear of retribution. On this issue, Israel has come up against a state which truly is beholden to nobody. The Iraq War: "A Serious Violation of International Law"
One of Britain's most authoritative judicial figures last night delivered a blistering attack on the invasion of Iraq, describing it as a serious violation of international law, and accusing Britain and the US of acting like a "world vigilante". Lord Bingham, in his first major speech since retiring as the senior law lord, rejected the then attorney general's defence of the 2003 invasion as fundamentally flawed. Contradicting head-on Lord Goldsmith's advice that the invasion was lawful, Bingham stated: "It was not plain that Iraq had failed to comply in a manner justifying resort to force and there were no strong factual grounds or hard evidence to show that it had." Adding his weight to the body of international legal opinion opposed to the invasion, Bingham said that to argue, as the British government had done, that Britain and the US could unilaterally decide that Iraq had broken UN resolutions "passes belief". Addressing the British Institute of International and Comparative Law last night, Bingham said: "If I am right that the invasion of Iraq by the US, the UK, and some other states was unauthorised by the security council there was, of course, a serious violation of international law and the rule of law. Of course Lord Bingham is right. The Iraq war was blatantly illegal, as I have always maintained. But it's not good enough, five years on, to merely state that the war was unlawful. We need to make sure that the perpetrators of the war- namely George W. Bush and Tony Bliar- a man who is millions of pounds richer because of the conflict-and the neocon men and women who planned it, are bought to justice. The Nuremburg judgements held that to launch a war of aggression is the 'supreme international crime'- and it is obscene that five years on, those responsible for this outrageous crime- which has led to the deaths of up to 1m people, are still at liberty. Furthermore, it's also important too that those journalists and writers, who propagandised for an attack on Iraq- in contravention of international law- are also are held accountable for their actions. The trial of Julius Streicher after WW2 sets the precedent. 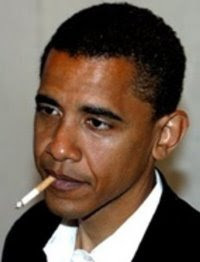 "Have any of you ever seen a picture of Mr Obama, a heavy smoker, with a cigarette in his mouth? No, nor have I. Why is that?" asks my friend Peter Hitchens in his weekly column. Well, Peter, just for you, there's a picture of Obama smoking above, but it's true that he hasn't been pictured smoking for a long while. Is he intimidated by the anti-smoking fanatics who will denounce him as a man not fit to be President if he is seen to light up in public? (thank goodness they weren't around in the days of FDR and Winston Churchill, otherwise the Allies would never have won the Second World War). There's been a lot of talk recently about whether Obama has courage, and he can show that he does by following the example of Maggie Gyllenhaal, this blog's choice for President in 2012 and light up live on prime-time tv. But there's a second even more important thing he can do to show us all that he's courageous. And that's to resist the growing pressure- being asserted by certain powerful interest groups- to appoint the neocon's favourite Democrat Hillary the Hawk as Secretary of State. People voted for Obama because they wanted a clean break with the aggressive, pro-war policies of the past. Appointing a woman who played such a key role in the illegal NATO aggression against Yugoslavia in 1999, who supported the equally unlawful Iraq war, and who has threatened to "obliterate" Iran, would be a betrayal of all those ordinary Americans who wanted something different. "Wars, conflict- it's all business"- sighs Monsieur Verdoux, the eponymous anti-hero in Charlie Chaplin's classic film. This report from today's Mail on Sunday hardly disproves the thesis. The man who acted as go-between for Tony Blair and George Bush in the run-up to the Iraq War has been given a senior post worth an estimated £50,000 a year with U.S.-owned arms company Lockheed. Sir David Manning (pictured above, on left, next to George Bush), Britain's former ambassador in Washington has also joined a shadowy UK intelligence firm set up by former spies. Sir David was Mr Blair's foreign affairs and defence adviser. He stepped down as the UK's envoy in Washington two years ago. He played a key role in planning the Iraq War, and secret memos published after the conflict revealed how he knew Mr Blair had promised to go to war with Mr Bush a year before the conflict. Sir David has become a non-executive director of Lockheed's subsidiary, Lockheed UK. He will also act as personal adviser to the firm's chief executive, Ian Stopps. Lockheed is one of the most powerful defence firms in the world. It is proud of its role in the Iraq War and published an 'Operation Iraqi Freedom' brochure that described how its 'stealthy F-117 Nighthawk opened the Allied operation with a strike aimed at Saddam Hussein's leadership'. The heir to the British throne (pictured above) is 60 today. Here's my piece from The Australian, first published in 2005, on why a King Charles III would be preferable to a more politicised Head of State. Do you agree? George Orwell got it only half right. It’s not just some animals that are more equal than others. It’s royalty too- as last week’s events surely demonstrate. Royal 1 visits Australia: goes yacht racing with her husband, attends glitzy balls in designer outfits and is fawned over by even the most hard-core republicans. Royal 2 visits Australia: goes to see victims of the Bali bombings, addresses indigenous issues and is lambasted in Parliament for wasting tax-payers money. Of course, there are important differences between Crown Princess Mary of Denmark and the heir to the British- and Australian throne. As the Sydney Morning Herald so succintly put it, one is young and beautiful and the other is not. Then there is the small matter of nationality. ‘Australia loves this uber couple because they are young, gorgeous and 50% locally made’ says Emma Toms of Fred and Mazz. Chazz, one the other hand, may have visited Australia ten times and spent two terms at Geelong Grammar, but is - and always will be a Pom. But even allowing for the above, it still seems to me that Prince Charles has been given an unnecessarily rough ride- not only in Australia- but back in Britain too. I write not as a die-hard supporter of hereditary monarchy, but as an unreconstructed leftist and staunch believer in meritocracy. But if we are to have a constitutional monarchy- and on consideration of all the other options, it still seems the least worst- then it is difficult to imagine a man more suited to the task than the 56 year old in a double-breasted suit who has been touring this past week. For a start, unusually in this age of spin and counterfuge, insincerity and mock concern- Charles is a man of profound integrity. ‘Prince Charles cannot but tell the truth. I have never met anyone in public life who is quite like him in that sense’ is the verdict of his biographer, Jonathan Dimbleby. It takes courage to admit to committing adultery in a television documentary and when someone with such a track record for honesty says that he only did so when his marriage had ‘irretrievably broken down’, he must surely be given the benefit of any doubt. Then there is the intelligent contribution Prince Charles has made to matters of national and international concern. While his critics seek to portray him as an old-fashioned fuddy-duddy, hopelessly out of step with the spirit of the times, Charles’ line on many issues is far more progressive than that held by many so-called leftists. He was the first British royal to question the suitability of the monarch of a multi-racial, multi-faith country ( to say nothing of the Head of the Commonwealth)- to be the ’Defender of the Faith’ and not ‘the Faiths’. He has consistently championed the cause of alternative medicine and of a holistic approach to health. He has made speech after speech warning of the dangers of deforestation and global warming and has spoken out against the disastrous effect large scale capitalism has on both the environment and the social cohesion of communities. And the man who many dismiss as the epitome of privilege, has through his own Princes Trust and countless other charitable projects, helped thousands of disadvantaged people to achieve their goals in life. On issues where Prince Charles has taken a more ‘traditional’ line, he has arguably not been behind the times, but paradoxically ahead of them. It’s the proponents of modernist and post-modern architecture and of 1960s teaching methods whose theories now appear hopelessly dated: Charles’ attacks on them -regarded as blasphemy when first made in the 1980s -now appear to most sane individuals as the voice of sheer common sense. Prince Charles’ ingrained scepticism -and his understanding that so many of the great issues of the day are not black and white, but grey- is a huge plus point in an age where once again it is the cocksure and the Manichaeans who are calling the shots. Charles’ scepticism extends not only to modern architecture, trendy teaching theories and what he calls ‘militant humanism’, but also to the war in Iraq, about which he is reported to have had grave misgivings. Then there are Charles’ other qualities to consider. As all those who met him this past week, will no doubt testify, he is a man of rare charm and wit. From his good-humoured reaction to being offered witchetty grubs and honey ants at Alice Springs to his quip to Vietnam veteran Gary Johnston that there was ‘no bloody room’ at his forthcoming wedding- the Goon Show-loving Royal Prince surely can’t be accused of lacking a sense of humour. All in all, when you consider that Prince Charles has had to overcome the twin handicaps of a British public school education (to say nothing of two terms at Geelong Grammar) and a father for whom any display of affection is regarded as a crime on a par with murder- then the future King's well-roundedness is even more remarkable. Should the fact that Charles is clearly a ‘bloody good bloke’ alter our view of the monarchy in general? In theory it shouldn’t- but as we’ve seen from the past week- the identity of the royal in question undoubtedly has an impact on the way the institution is regarded. And I for one would rather have a Head of State who combines integrity, humour and scepticism in equal measure, than a politicised President who would probably be lacking in all three. Thank goodness, they might be thinking at the US State Department and the British Foreign Office, for the financial crisis. Were it not for the ever-blacker news about the Western world's economy, another scandal would be vying for the headlines – and one where the blame would be easier to apportion. It concerns our two countries' relations with Russia and the truth about this summer's Georgia-Russia war. It's now clear that Georgia started the war in South Ossetia. Why did US and British accounts give the impression that Russia was the guilty party, and Georgia a brave little democracy that big bad Russia wanted to snuff out? asks Mary Dejevsky in the Independent. How were we so sure that Georgia and not Russia was the aggressor? Well, I can't speak for The Exile, but for me it was an easy one. The neocons said Russia was the aggressor and as I’ve said before on many occasions-we always know when neocons are lying: they open their mouths or start typing on a keyboard. So why were British and US officials so cagey about acknowledging, or perhaps even believing, what had really happened? Why did the Conservative leader, David Cameron, rush to Tbilisi to support Georgia as the unquestioned victim? And why – except to trump Mr Cameron – did the Foreign Secretary, David Miliband, give a tub-thumping speech in Kiev shortly afterwards that perpetuated the impression (without actually using the words) that the war was all about Moscow's supposed ambition to reconstitute its empire. That’s another easy one to answer. Cameron and Miliband are both members of Britain's neocon/neoliberal ruling junta. Baiting the Russian bear- and cheerleading for ‘plucky little Georgia', the neocons favourite ex-Soviet republic- is a compulsory part of their shtick. But what about the non-neocon commentators who still parroted the ‘Russian aggression/plucky little Georgia’ claptrap. Why didn’t they understand better what was going on, as the Exile, blogging thousands of miles away from the action in Mexico, did? For the answer to that one, we need to turn to a great American writer. As Upton Sinclair wrote: "It is difficult to get a man to understand something when his job depends on him not understanding it". Hat-tip for the Mary Devesky article: Charlie Marks. I was watching the Remembrance Day commemorations on television today with my father, who served in the army, when I heard something that neither of us much liked. The presenter Alistair Stewart said that while Remembrance Day was originally about remembering those who died in The Great War, and then World War Two, it's now about remembering other conflicts in which British forces were involved, including Iraq. If that is indeed the case, then it's wrong. Remembrance Day should only be about the two World Wars. In neither the First, nor the Second World War, was Britain the aggressor. In Iraq, it was (alongside the US). While in the Second World War, Britain's role in helping to defeat Nazi aggression, was an honourable one, in Iraq it was not. A largely defenceless country, which posed Britain no threat, was attacked on the basis of a colossal lie. The Iraq war, together with the earlier, equally unlawful- and equally deceitful aggression against Yugoslavia in 1999, was a dark moment in Britain's history. It was a shameful episode, and those who planned and orchestrated it should, if there was any justice in this world, be behind bars. The Nuremburg judgement after all, held that the greatest of all crimes was to launch a war of aggression. So let's wear our poppies today and remember those brave soldiers who gave their lives in two world wars. But let's make sure that any attempts to 'normalise' the Iraq war and put it on a par with World War Two are resisted. What do you call someone who spends hours and hours maliciously editing the wikipedia page of a journalist he doesn’t like (including at Christmas) and then sends the journalist in question six aggressive, abusive emails in a short period of time on one Saturday afternoon and then twelve the following night? Well he goes by the moniker of ‘philip cross’ and he doesn’t like me very much at all (although he does seem to like a certain former hedge fund manager called Oliver Kamm very much). 'Philip' is also a very big fan of Henry Jacksonsite MP Denis McShane as you can see from his editing of McShane's wikipedia page. He's even edited the page of McShane's former wife, the late Carol Barnes. In fact so incensed was 'Philip' when I referred to McShane by his original name 'Denis Matyjaszek' that he darted over to my wikipedia page to insert the maiden name of my wife, failing to see the difference between a woman who takes her husband's surname on marriage, with a careerist politician who hypocritically berates the British for not being 'pro-European' enough, while changing his original Polish surname. You can read some of 'philip cross’ contributions in the comments section of this thread: the idea that neocon columnists might become rarer in newspapers in the year ahead due to readers having had enough of reading their lies, really seemed to inflame him. That’s despite having already been warned by a senior wikipedia editor to stay clear of my page. Actually, 'wally' is far too polite a term for ‘philip cross‘. ‘Pathological obsessive’ is far more accurate. Despite the warnings he's received 'philip' simply can't leave me alone. But as you’ll see from his other edits- this particular pathological obsessive is- however cranky he appears - following a very clear political agenda. You can read more on philip cross' extraordinary obsessions here and here. This article of mine appears in The Morning Star. If voting changed anything they’d abolish it, the old maxim goes. If anyone doubts the truth of it, just visit Hungary. Earlier this year the Hungarian people heavily rejected, in a national referendum, three key elements of the neo-liberal government's "reform" programme: the imposition of hospital and doctor's visit fees and the imposition of higher education tuition fees. Hungary’s ruling elite were furious. Janos Koka, of the fanatically neoliberal ‘Free Democrats’(SZDSZ), a party whose embrace of unbridled capitalism makes Thatcher’s Tory party look like social democrats, reacted by asserting that he would “like to assure the international money and capital markets that the government upholds its commitment to reforms and a strict and tight budget,"- in other words that the people‘s democratic will, as expressed in the referendum, counted for nothing. After leaving the government in early summer after a row over the budget, the decidedly anti-democratic ‘Free Democrats’ spent the next few months calling for a ‘government of experts’ to be appointed in Hungary. We know the sort of ‘experts’ they had in mind- ‘free market’ ideologues like the notorious Dr Lajos Bokros, from the George Soros-funded Central European University- a man who supports the introduction of compulsory private health insurance and who has questioned "the subjective right to receive a pension". The SZDSZ has now dropped its call for a ‘government of experts’, because they have got something even better. Last month, Hungary applied for- and received a $25bn ‘rescue package’ from the IMF, World Bank and European Union. The collapse of the Hungarian economy is of course a shocking indictment of the hardline neoliberal policies that the ruling MSZP/SZDSZ coalition have been following over the past six years, policies that have been lauded by foreign capital and their political emissaries. But while Hungary’s bail-out is undoubtedly a national embarrassment, for the country’s ruling elite it has served a definite anti-democratic purpose. It is widely accepted that the size of the rescue package- which dwarfs that of neighbouring Ukraine- far exceeds the amount the country needs. But by signing up to the deal- and to the strings attached- the Hungarian government is effectively stymieing the opposition’s plans to plot a different economic path when it comes to power in the election of May 2010. It's clear that the government intends to use the ‘rescue package’ as a excuse to carry out the ‘reforms’ and the swingeing cuts in public spending it always wanted to implement- and to end any political debate as to whether the ‘reforms’ and cuts should be imposed or not. A classic example is the abolition of the totemic 13th month salary for public sector workers, paid at Christmas each year. “We did not need to cut the payments to get the IMF’s help. We did it to send a clear message to investors that the government is ready to make cuts.“ admitted government spokesman David Daroczi. The rescue package gives the government the excuse to rush through the privatisation of those assets which in remain in public ownership. Late last month the SZDSZ/MSZP faction on Budapest council voted to sell of the city’s gas company. The national grid is also to be flogged off; bus and postal privatisation is in the offing too. The rescue package also gives the government the opportunity to hammer the final nail into the coffin of the country’s chronically underfunded state health service. In its new budget, the government has proposed cuts of HUF35bn for the Health Insurance Fund- cuts which have been described as ‘fatal’ by the opposition. The country’s long-suffering pensioners, already facing massive hikes in their fuel bills this winter, are also in the neoliberals’ firing line- with a freeze on their annual bonus and the elimination of the annual bonus for early retirees. It matters little that all these extremist policies are opposed by the vast majority of the public. The reforms are described as ‘apolitical’- measures that simply have to be passed. Interestingly though there is one item of government expenditure that the Hungarian government- and their Free Democrat allies do not support cutting back. After NATO’s two day conference in Budapest last month, Defence Minister Imre Szekeres said that Hungary would increase spending by 7% next year and by 0.2% of GDP annually over the next five years. The country that can’t afford toilet paper for patients in state hospitals, does it seem, have money to send Hungarians to take part in imperial adventures at the behest of Uncle Sam in Afghanistan. What recent events in Hungary demonstrate is that democracy is inconsistent with neo-liberalism. The only democracy modern turbo capitalism allows is of the ‘Henry Ford’ variety- namely that the people can vote for any polices they like- so long as they are the ‘approved’ neoliberal ones which put the needs of capital- before people. So even if people vote in their millions, as they did in Hungary in March against extremist neoliberal solutions, the elite finds ways of subverting their wishes. Former Italian Foreign Minister Lamberto Dini recently admitted that NATO aggression against Serbia (March 24 — June 10, 1999) had nothing to do with the alleged humanitarian concerns — NATO bombed Serbia for three months because the United States and Britain wanted to have a military base on its territory. Dini said Serbian officials would have signed the ultimatum issued by the West at the conference in Rambouillet, if it had excluded only one word. - The problem was only one adjective. It would have been sufficient for Serbia if the document excluded the word "military" and left only the "international presence" in Kosovo, but the U.S. insisted on NATO getting an opportunity to enter the province - Dini explained. Next time you read a commentator in the MSM talk about NATO’s ‘humanitarian’ intervention in Kosovo, just email them the link. It’s time to set the ‘official’ record straight. POINT OF CLARIFICATION: The country which NATO illegally bombed in 1999 was of course called the Federal Republic of Yugoslavia, and not Serbia, which did not exist as a sovereign state at that time. But I've kept 'Serbia' in the account above because it was the word used by the Lamberto Dini. With every passing day of economic woe, the scale of the heist just perpetrated against America's taxpayers by the country's largest banks becomes more apparent. In the shadow of the presidential election, the nine biggest banks were given $125bn of taxpayer money with the understanding they would send this fresh capital coursing into the economy in the form of loans. Unfortunately, the US government forgot to get the lending requirement in writing. Instead, the banks are sitting on the money, earning interest and mulling mergers and acquisitions and replenishing bonus pools for their employees. writes Philip Delves Broughton in today's First Post. If you are an American taxpayer, (and I know that around 25% of this blog's readership is US-based), I'm afraid you've been the victims of what Delves Broughton rightly calls the biggest bank heist ever. The biggest bank robbers don't wear stripey jerseys, black masks and carry bags marked 'Swag'; they wear suits and hobnob with the political elite. Or, as Berthold Brecht so memorably put it: "What is robbing a bank compared to founding a bank?" "Obama will not win the presidency: America will have been made to feel sufficiently good about itself simply by his nomination and the way it responds to him as a candidate not to feel the need to put him in the White House. America will decide that in such dangerous times, it must choose the wise older leader, the war hero, the statesman who talks about foreign policy and national security with real authority." "For what it is worth, I think it will be a close presidential race with the favourite, Obama, winning by a squeak." Janet Daley, Daily Telegraph, November 2008. Well, I hope you took my advice and headed down your local bookies to bet on an Obama landslide. If Daley, the world's worst pundit, said that Obama would win by a squeak, we knew for sure he'd win at a canter. 'The scale of Obama's victory exceeded Democratic expectations' reports The Guardian as the man Ms Daley assured us "will not win the Presidency" recorded the most emphatic win in a US Presidential election for two decades. It's great to see the uber neocon McCain/Palin combo suffer such a heavy defeat. The American people have delivered a damning verdict on the past eight years- and disastrous neoconservative/neoliberal policies pursued by Bush and Cheney. But while public opinion in America (and Britain too for that matter) has undoubtedly shifted to the left, neocon/neoliberal voices are (scandalously) still disproportionately represented in both countries mainstream media. Expect that to change over the next couple of years: people will simply stop reading columnists- and the newspapers they write for, if they consistently tell them things that they know not to be true (such as 'unregulated free market capitalism is good for everyone'; 'Barack Obama is a hard-line socialist' and 'soft' on terror, or that Russian and Iran pose 'a grave threat' to the west). With their ridiculous attacks on Obama and bellicose pro-war rhetoric, uber neocon writers like Janet Daley, William Kristol and Melanie Phillips are totally out of step with the new spirit of the age. They've been proved wrong on virtually everything they've written about over the past ten years and their moment has well and truly passed. I know he's not a 'socialist', as Simon Heffer ludicrously claims. I know that his plans for extending health care are not as comprehensive as they should be. And I know that he's not the Messiah. But nevertheless, it has to be Obama. And the reason why? Well, as American divorcee Mary Treadwell (played so memorably by the late Vivien Leigh) says in the clip above from that wonderful, wonderful, film Ship of Fools, "in life if you can't get what you want, you'd better damn well settle for what you can get". I'd like to see an unequivocally and unapologetically socialist, anti-war US President, someone who would give Americans the same universal state health care system that we enjoy here in Britain. A President who would pull US troops out of both Iraq and Afghanistan and announce that the US would henceforth only act in full accordance with international law. But we can't get that at present so we need to settle for what we can get. And that's Barack Obama. And what is Barack Obama's main attraction? Simply that he isn't John McCain. Make no mistake, a McCain presidency would be a nightmare. John McCain wants to bring them(the neocons) back, in triumph, on horseback. That’s not all. Top McCain advisers like Robert Kagan seek to reignite a Cold War with Russia: Kagan recently told a Washington audience he wouldn’t want to live in a world in which Russia had a preponderance of influence over Georgia. Elliott Abrams, son-in-law of Norman “World War IV” Podhoretz, is reportedly in line to head McCain’s National Security Council. As a Bush appointee, he’s worked at stymieing the peace process between Israel and the Palestinians. Expect a McCain administration to back the Netanyahu policy of turning the West Bank into isolated bantustans instead of a Palestinian state. For these reasons, I’m voting for Obama. While he doesn’t inspire me, he does impress. His two-year campaign has been disciplined and intelligent…..If elected, he will inherit an office burdened with massive financial and foreign-policy problems. Unlike John McCain, he won’t try to bomb his way out of the mess. Well, we don't know for sure that Obama won't 'try to bomb his way out of the mess'. But he's certainly less likely to do so than John 'Bomb, Bomb, Bomb, Bomb Bomb Iran' McCain and for that reason alone he has to get the nod. "His problem is not so much that he is an African-American in the modern political sense of being a black American. It is that he is an African-American in the literal sense of being half African and only half American." the Daily Telegraph's uber neocon columnist has now submitted an article so silly it even makes 'Mad' Mel Phillips' offerings on Obama look relatively sane (and that is saying a hell of a lot). Daley has spent the entire year throwing all the usual neocon insults at Obama- ie he's soft on 'terror', he's a luxury the 'free world' cannot afford etc etc; now she's turning her attention to the damage Comrade Barack would do the US economy with his terrible plans to 'spread the wealth'. "There is another facet of Obama taxation with even more serious consequences for the US. In order to pay for his tax cut for 95 per cent of the population (half of whom do not pay income tax and whose "cut" would be in the form of a cash rebate), President Obama and his Democratic Congress would raise the US rate of corporation tax - already the second highest in the world - from 15 to 20 per cent. They also plan to punish through taxation companies that employ people overseas rather than "creating American jobs". Wow, how revolutionary! How Marxist! Raising corporation tax to 20%! Using the taxation system to encouraging firms to employ people in America and not in Indonesian sweat shops! What a catastrophe that would be for ordinary American people! Obama will not win the presidency: America will have been made to feel sufficiently good about itself simply by his nomination and the way it responds to him as a candidate not to feel the need to put him in the White House. Then again, predictions are not really Ms Daley's strong point. This is after all the same journalist who labelled the moral case against the Iraq war to be "at best naive, at worst idiotic" and who believed (please, no sniggering at the back), the existence of WMDs to have been established by Blair's dossier. Now, having told us emphatically that 'Obama will not win the Presidency', Daley thinks he'll win 'by a squeak'. You know what that means, folks. Get down your local bookies and put a bet on an Obama landslide. NEWS FLASH: Janet Daley's Daily Telegraph colleague Simon Heffer has made a last-gasp attempt to grab the 'Silliest Anti-Obama article of the Year Award' with this ridiculous offering. He has been branded a socialist by Sarah Palin and, because it was Sarah Palin doing the branding, the term was ridiculed by media here who are almost clinically biased against the Republicans. However, when one examines Mr Obama's rhetoric about "spreading the wealth", and looks at spending promises made in the past 21 months, socialism is a fair term. He plans, or at least has promised, expensive projects - such as healthcare reforms. As questionnaire says in the comments to this post, it really doesn't take much to be labelled a 'Marxist' these days. Or a 'socialist' either, as far as Daley & Heffer are concerned. The late, great Dr Erich Fromm (above) lambasted the way that in ultra-materialistic capitalist societies we talk of how much human brings are 'worth' in monetary terms. I wonder what Fromm would have made of this truly disgusting report in the Daily Telegraph on the new world motor racing champion Lewis Hamilton. Lewis Hamilton will very soon be bigger than David Beckham, public relations experts predicted as the racing driver sealed the 2008 Formula One World Championship in Brazil. He is currently thought to be worth around £15 million, according to Auto Trader's Motoring Rich List - less than half that of fellow British F1 driver Jenson Button. Mr Clifford said: "He is going to be bigger than David Beckham, because he is only 23 and motor racing is even more lucrative than football. "If you were to chose a sport from a purely financial point of view, motor racing would have to be number one." He continued: "Lewis Hamilton is young, he is obviously talented and he is a good looking fellow, so you have a perfect recipe for sponsorship." Becoming world champion would transform him into a household name in Britain and around the world, he said. "We don't have many world champions, so the media here will become even more crazy about him that they already are," he said. "That will just add to his worth." Many congratulations to Lewis Hamilton on winning the World Championship. But wouldn't it be nice, if instead of talking about how many millions of pounds he is now 'worth', we simply lauded his achievement? After this latest fiasco is there anyone (apart from the loonies at the Adam Smith Institute), still willing to argue that the increased involvement of the private sector in the business of government has led to greater efficiency? If like me, you feel that 'enough is enough' and that it's time to call a halt to Britain's disastrous twenty-nine year obsession with privatisation, then there's a newly formed pressure group just for you.